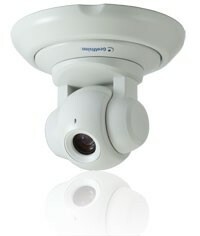 The GV-PT130D is an indoor pan and tilt camera that is designed to monitor a wide surveillance area. The camera supports remote pan and tilt control and is capable of storing pre-established panning/tilting movements and points on live view for immediate monitoring. Equipped with IR LEDs and IR-cut filter, the camera provides excellent image quality in the dark.